"Steve Irwin, The Crocodile Hunter"
"Oh, Crikey, We're Gonna Miss Ya"
My thoughts and prayers go out to Steve Irwin's family and friends. 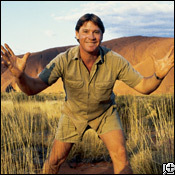 Steve managed to make millions of people be unafraid of snakes and crocodiles, and many other wildlife species. He made them interesting for the first time in so many peoples' lives. Steve and his family also did a lot for the environment, for nature, and for all of the animals. His legacy will live on for generations to come!